After a D.C. woman was killed during a run through Logan Circle earlier this week, two local running coaches share safety tips for all runners to remember when they step out the door. WASHINGTON — A woman was killed earlier this week during a run in D.C.’s Logan Circle neighborhood, and while so much is not known about what led to her death, two local running coaches say it’s a reminder about the importance of running safety. Wendy Martinez — who was described by her family as an “avid runner” — was fatally stabbed Tuesday during an evening run. Even the most experienced runners have to keep safety in mind every time they head outside, said Julie Sapper and Lisa Reichmann, co-founders of the running coaching company Run Farther and Faster. “Sometimes really awful things happen, and in this case we very much believe that Wendy was in the wrong place at the wrong time, and there was nothing she could have done. But generally speaking, we can always be safer,” Sapper said. 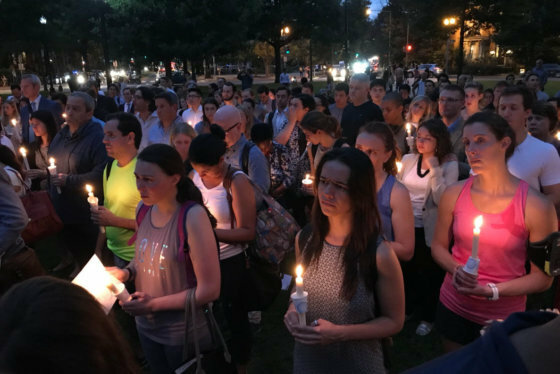 During an emotional vigil in Northwest D.C. Thursday, the mother of slain runner Wendy Martinez said she forgives the man who killed her daughter. Wendy will be buried in the dress she planned to wear at her upcoming wedding, the dress mother and daughter shopped for just last weekend. One of the most important things runners can do is run in a group or with someone else, Sapper said. “Running with other folks is an automatic protective mechanism that allows people not only to feel safer, but they actually are safer,” Sapper said, adding that when runners aren’t able to run in a group, they might choose to run in a busier, more populated place, such as a track. If running in a group is not an option, runners should let someone else know where they’re going, how long it will take and when they will check back in, said Reichmann. Wearing the right gear can be essential. Runners should always dress to be seen — that means headlamps, reflective vests or lights on their shoes. For runners who don’t have any of those things, “even a simple flashlight, if it’s dark or becoming dark on your run, is really great to be seen,” Sapper said. Runners should be wise about the gear they bring, too. Don’t leave the house without a fully charged cellphone, Reichmann recommended. “Not only for personal safety to use if you are in danger yourself, but if you come across a runner or a pedestrian or a car or someone else who needs help, having a fully charged cellphone with you is really important,” Reichmann said. Whistles, key chains and alarms, such as Run Angel, that trigger noise and light can frighten an attacker. Other gear such as Garmin GPS watches and the Strava run-tracking app can share runners’ locations with a designated groups, so friends or family know where runners are. So what should runners leave behind? Headphones, the run coaches said. Runners should focus on being aware — that means running without headphones. If you must wear headphones, put just one earbud in. Weapons should not be part of a runner’s plan because it could be turned against them, Sapper said. “If someone is going to use pepper spray or some type of weapon, they need to be experienced and understand how to use it,” she said. Runners, no matter where they decide to go, need to vary their routes and be cognizant of their patterns, Reichmann said. “If you go out every evening after work or every morning at a certain time and you run the same route time after time, you’re very predictable, so if someone is watching you and waiting for you it’s pretty easy to become a target,” Reichmann said. Also, while women are often the focus of running safety messages, men can just as easily be targets, Reichmann added.